The nice people over at Expedia recently asked me to create a French recipe for their #expediaworldonaplate challenge. Each month Expedia’s World on a Plate Challenge focuses on the cuisine of a different part of the world and this month it's France. Having very little knowledge of French cooking I came across the French equivalent to pizza, Tarte flambée from Alsace; a northeastern French region on the Rhine River plain. Alsace borders Switzerland and Germany and there's a south German version called flammekueche and flammkuchen; which in German means 'flame cake'. Anyway, Tarte flambée looked and sounded good to me so I had a go at making it! Slight problem - Fromage blanc is one of the ingredients used for this and it seems almost impossible to find here in the UK. 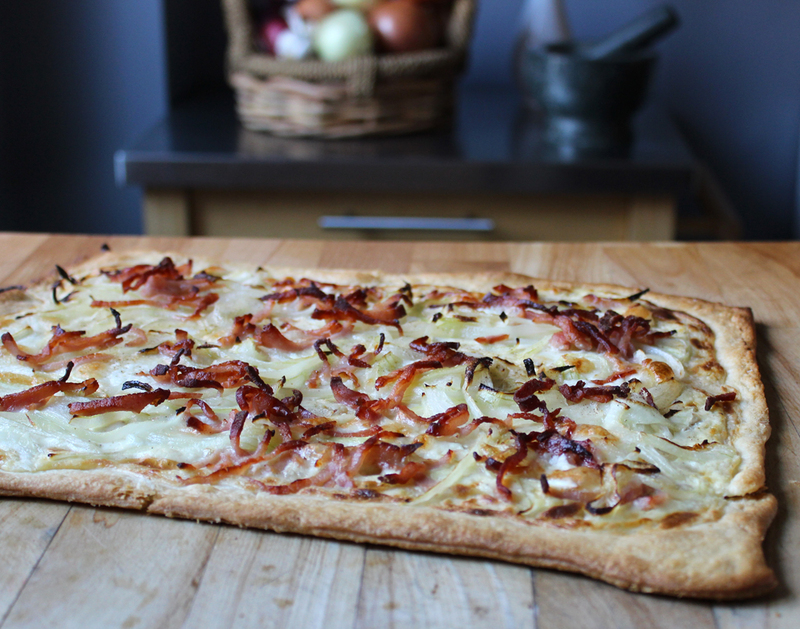 Not to be put off and up for a challenge I decided my Tarte flambée recipe would just have to be different to the norm. Actually I have no idea what Fromage blanc tastes like but after checking it out on the net and reading that you can substitute it with Greek yogurt; although please don't quote me on this as it's only something I read. Greek yogurt in a French recipe didn't sound right, so I decided my Tarte flambée would be all the better if I used Chavroux, a mild soft goats cheese; after all everything tastes better with goats cheese! Keeping it French I used Chevroux and even if I do say so myself, this turned out to be a good choice since my version of Tarte flambée was rather nice indeed and got eaten up straight away. Eat and enjoy with a nice glass of chilled white wine; French of course. Tarte flambée from Alsace; a northeastern French region on the Rhine River plain. Alsace borders Switzerland and Germany and there's a south German version called flammekueche and flammkuchen; which in German means 'flame cake'. Anyway, Tarte flambée looked and sounded good to me so I had a go at making it! Put your oven on to preheat. In a small bowl mix the creme fraiche with a pinch of sea salt, a pinch of white pepper and a pinch of nutmeg. Heat up a large frying pan and add a tiny bit of olive oil. Put the onions in until they start to soften to but don't let them colour. Remove the onions and set aside to cool. Now add another tiny dribble of oil to the pan and cook the bacon just to remove any moisture; don't let it colour. Remove and set aside to cool. Lay a sheet of greaseproof paper on a baking sheet and pop the pastry (about 35cmx22cm) on top. Spread the crème fraiche mixture over the pastry leaving a 1cm edge. Cut the Chavroux into 5mm slices and dot evenly spaced on top. Sprinkle over the onions followed by the bacon. Lightly brush the edge of the pastry with a little oil. Put onto the middle shelf of your oven and cook for about 12 minutes. If you’d like to join in with the Expedia World on a Plate recipe challenge, just tag pictures of your food creations with #expediaworldonaplate on Facebook, Twitter or Instagram. Click for more French World on a Plate recipes. Disclosure: This post is in collaboration with Expedia as part of their World On a Plate Challenge. I love goats cheese too. I'd definitely make it, but no bacon for me of course. This looks great! 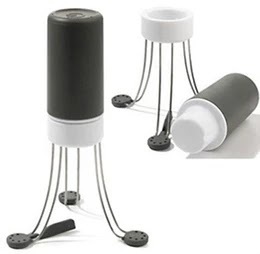 So adaptable, too! Looks utterly delicious. I adore goats cheese and have a serious weakness for flaky pastry so this is right up my street.